1 Daughters of the American Revolution Genealogical Research System, Ancestor #A089787. 2 Find A Grave, (accessed 05/10/2013). 3 Illinois Statewide Marriage Index, 1763-1900, License #3080, Marriage record for Anson T. Hemingway and Adelaide Edmonds, Illinois State Archives. 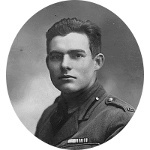 4 Illinois, Deaths and Stillbirths, 1916-1947, Death record for son Clarence Edmonds Hemingway, FamilySearch.org (Online Database). 5 Illinois, Deaths and Stillbirths, 1916-1947, Death record for Anson Tyler Hemingway, FamilySearch.org (Online Database). 6 U.S., Sons of the American Revolution Membership Applications, 1889-1970, SAR #8395, Membership application for Anson T. Hemingway, Ancestry.com (Online Database). 7 U.S., Sons of the American Revolution Membership Applications, 1889-1970, SAR #16135, Membership application for George Roy Hemingway, Ancestry.com (Online Database). 8 Hemingway, Patricia S., The Hemingways: Past and Present and Allied Families, Rev. Ed., Baltimore: Gateway Press, Inc. (1988), 153, 216-232. 9 Roberts, Gary Boyd, "#53 Royal Descents, Notable Kin, and Printed Sources: Major Historical Figures Descended from Anne (Lloyd) (Yale) . . .", (accessed 12/02/2016), New England Historic Genealogical Society (Online Database). 10 White, Emma Siggins and Martha Humphreys Maltby, Genesis of the White Family: A Connected Record of the White Family Beginning in . . ., Kansas City, Missouri: Tiernan-Dart Printing Co. (1920), 224-225, Google Books (Digital Library).